Slow down: If you are usually the first person to clear your plate, there is a good chance you are not chewing your meals thoroughly. This habit is not good at all, because chewing breaks down food and activates enzymes in your mouth that help with digestion. In fact, researchers found that when people chewed almonds 40 times, they absorbed more healthy fat than when they chewed them just 10 times, making nutrients like vitamin E more accessible. Calm your dining scene: When you are under pressure, your brain releases stress hormones that make your heart beat faster and give you a rush of adrenaline. The digestive process then slows down or stops so that your body can devote all its energy to deal with the stress. That is why being anxious or even multitasking during meals can interfere with nutrient absorption. So try to relax as much as possible when you dine. Ease up on a few workouts: Too many high-intensity interval training (HIIT) routines can also stress your digestive system. The physical effort of a tough workout causes your system to divert energy away from digestion. Balance the hard-core sessions in your schedule with lower-key ones, like yoga, which can help keep your digestion on track. Vigorous exercise can also deplete your levels of magnesium, a mineral that is critical for digestion. Create key food combos: Certain nutrients are better absorbed when they are eaten together. For example, your body has a tough time taking in the type of iron found in vegetarian sources like spinach, but consuming it with a food rich in vitamin C makes the process easier. 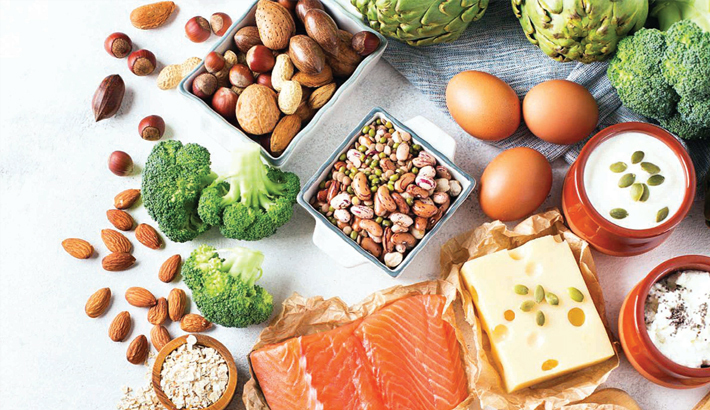 Fat-soluble vitamins A, D, K, and E need fatty acids for absorption, so pair foods that are rich in these nutrients with a source of healthy fat, like nuts or oil. To get more calcium from your yogurt, increase your intake of foods that are high in vitamin D.
Take stock post-meal: If certain dishes make you bloated or constipated or give you diarrhoea, you could have a food sensitivity or intolerance, which is relatively common. For instance, about 65 percent of people worldwide are sensitive to lactose, the sugar found in dairy. High-fructose foods like grapes and bananas and those with gluten, like bread and pasta, are other possible culprits. The inflammation you experience when you eat those foods can inhibit nutrient absorption in your small intestine. If you have any of these symptoms, ask your doctor about getting tested. Sip smarter: You have heard that you should not drink your calories, but now there is a major exception: it turns out that the body is better able to absorb nutrients from certain types of juice than from whole fruits. The fiber in whole fruit may bind to certain micronutrients, keeping them from being absorbed in the small intestine. But since fiber is the key to overall health, it is recommended having just one serving of fruit juice a day and eating the rest of your fruits whole.